The Grand Hotel, Commercial Street, Lerwick. "Hotels with character, come and enjoy the experience." Whether you are planning your first visit to Shetland, or you are a regular business visitor to the Islands, KGQ Lerwick Hotels Group welcomes you and, our aim is to help make your stay a memorable one. Prospective visitors might also want to check our low priced direct booking room rates (probably the cheapest in Lerwick), that are NOT available to those who book via on-line booking sites, our Latest News page, or our General Information pages which contain a lot of additional information about how our hotels operate including, About Shetland (information for the curious), How to get to Shetland (advice for 1st time travellers), a "bucket list" of Things to do on Shetland (a good list of activities and pursuits to help you enjoy your stay), a Shetland Events Diary (a list of the major events and activities on Shetland) and a Shetland Photo Gallery that you are very welcome to submit your own photos to. Additionally, one of the most important aspects of any hotel is the fare on offer. We have highly experienced and skilled chef's, waiting and kitchen staff at both the Queens and Grand hotels, and although we do not offer a Vegetarian Menu, we have a number of Vegetarian options on our menu's, and we are happy to cater for those with special dietry requirements. If this has whetted your appetite, sample Dinner Menu's for the Queens Hotel are available here, and the Grand Hotel, here. Above all, if you have any queries in regards of what we have to offer, or wish to advise us of a special diet, please advise our reception staff when booking, or get in touch using the Telephone, Telefax, Email address at the top of this page. If you prefer, you may also use the form on our Contact Us page. Right in the centre of town, and standing proudly in Lerwick's conservation area, catering equally for both long stay or Bed and Breakfast visitors, both our Queens and Grand hotels are traditional Shetland stone built Victorian era buildings that, despite being in excess of 150 years old, offer good quality and comfortable 3 Star accommodation conveniently located in the town centre. Situated on the Lerwick's main thoroughfare, Commercial Street, literally just a stone's throw from the harbour, our hotels make an ideal base for tourists, coach parties, visiting yachtsmen or business travellers, and both hotels offer quick and easy access to all the amenities you would expect to find in a busy town centre including, free car parking, banks, Tourist Information Centre, local shops, harbour, bus, ferry and taxi services. The Queens and Grand hotels both offer well appointed en-suite accommodation, equipped with the all usual extras, providing the 'home away from home' touch that means so much whilst our staff, as you would expect, are attentive, friendly and courteous, polite and helpful, and are committed to making your visit one you would want to repeat many times. Whether your requirement is for simple Bed and Breakfast or for a longer stay we offer some of the lowest priced direct booking room rates on Shetland. Spread between both our Lerwick hotels our accommodation comprises a total of 49 rooms made up of 17 Single Rooms, 9 Double Rooms, 20 Twin Rooms and 2 Triple Rooms making them ideally suited to single travellers, couples, families and coach parties. For that special occaison, we also have a large, comfortable Four Poster suite available at the Grand Hotel. 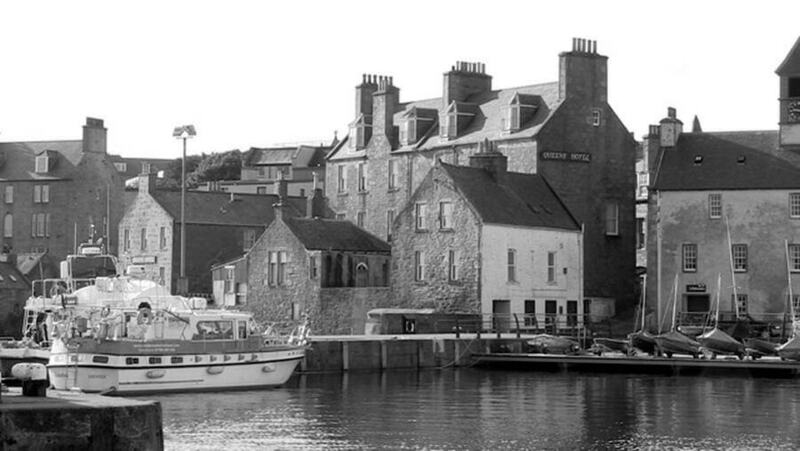 Some of our rooms at the Grand and most of our rooms at the Queens offer a view over Lerwick harbour. If you would like one of these rooms, please check availabilty when booking. Restaurants in Lerwick, we have two of the best. Eating out in Lerwick has never been better. Both our hotels have experienced, skilled chef's and high quality restaurants that are open 7 days a week for breakfast ,(7:30 - 09:00am weekdays, 08:30am - 10:00am Sunday) , lunch,(12:00 - 14:00pm) and dinner, (18:00 - 21:00pm), and whenever possible, serve the best of local produce. Breakfast at the Queens Hotel is served in the Restaurant whilst the Grand Hotel has a separate Breakfast Room. All other meals may be taken in either the Cafe Bars or the Restaurants. Guests and members of the public are very welcome to use our facilities and may take their meals (with the exception of breakfast) as Bar Lunches/Dinners in the Cafe Bar areas if preferred. Although our menus change regularly, sample menus for both the Queens and Grand hotels are available on these links otherwise, please contact our reception staff who prepare menus daily and will be able to tell you what is on offer each day. We also have a number of 'special occaisons' menus which are published in advance on our Facebook pages. Please visit the links at the bottom of this page for more details. The Queens Hotel has a comfortable Public/Lounge cafe bar with an attached games room whilst the Grand Hotel has separate public and lounge cafe bars. Both hotels welcome guests and members of the public who want to drop in and try some of our wide range of teas and coffees, fresh sandwiches, snacks, or a bar lunch. We also carry a good range of bottled and draught Beers and specialise in Gins (at the Grand Hotel) of all varieties, Wines and Spirits ,and if cocktails are your thing, our staff can serve you with a variety of different mixes. Guests and Visitors should note that although we are not licenced to sell alcohol before 11am, both the Queens hotel and the Grand hotel can provide other refreshments before that time. Posers Nightclub, "the best nightclub in Lerwick"
The Grand Hotel is also home to the ever popular Posers Nightclub. Open from 10:00pm Saturday nights until 03:00am Sunday mornings(and occaisonal Friday nights-Saturday mornings). Guests staying with us over a weekend are invited to join in and party with the locals at this very lively venue. Free Dual Band WiFi Internet Access. Free High Speed Dual Band Wireless Internet Access from multiple access points is available in all rooms, the public Cafe Bar areas and dining rooms in both the Queens and Grand Hotels. We are continually expanding our WiFi systems and, currently, good quality signals from at least two of our repeaters can be accessed from every room. 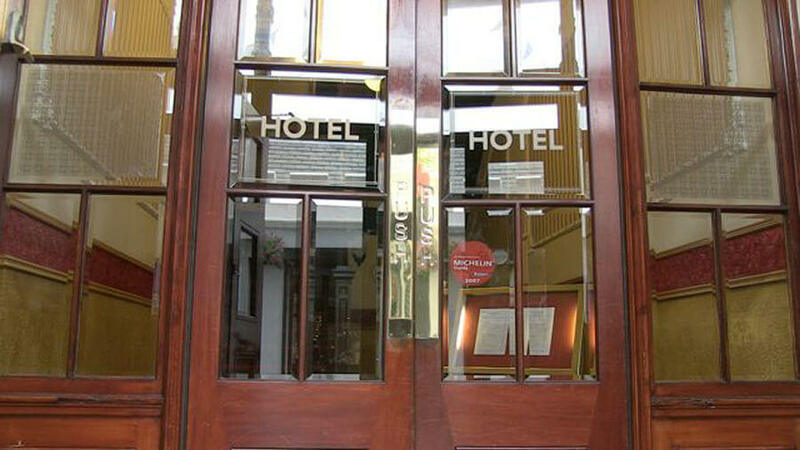 We welcome guests and visitors of all ages and abilities, but whilst our staff will assist in any way they can, we have to advise that due to the age and historic design of the buildings, wheelchair access to The Grand Hotel is non-existent and that wheelchair access to The Queens Hotel is limited to parts of the ground floor only. Those with other mobility issues should be aware that both hotels have a number of internal staircases, and again due to building design and other issues, it has not been possible for us to install lifts. With one or two exceptions, parking in Lerwick is generally free. The Grand hotel has a large free car park at the rear of the building whilst the Queens hotel has plenty of free parking space nearby. We are happy to host conferences, meetings, presentations and interview sessions and have ample space available for these activities at the Grand Hotel.